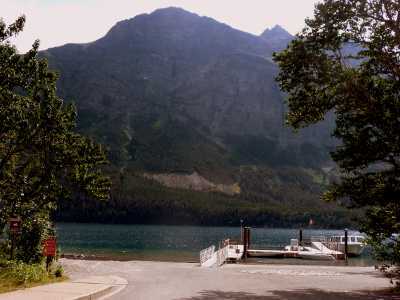 Launch: --Rising Sun Boat Launch for Saint Mary Lake, on Going-to-the Sun Road, i8 miles west of the Saint Mary Visitor Center. 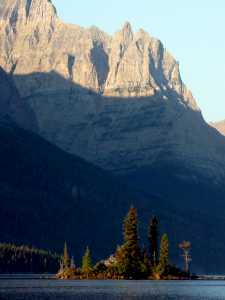 Nearby campsites:--Sites are too small (15-foot length max) at Rising Sun Campground. 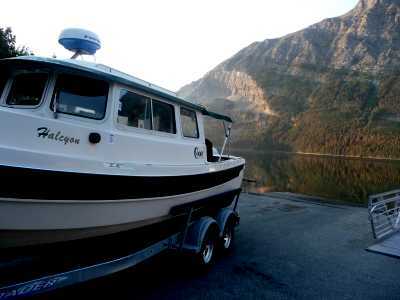 To keep boat and truck connected, use large and scenic pull-through sites at Saint Mary Campground about 15 miles east on the Going-to-the Sun Road. 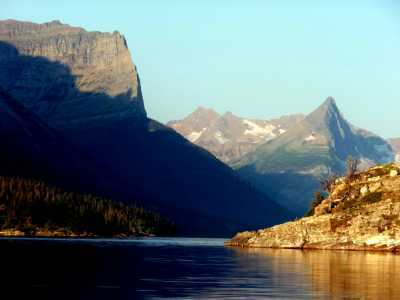 Comments:--Truck and boat trailer, combined length, is too long to cross the Going-to-the Sun Road. 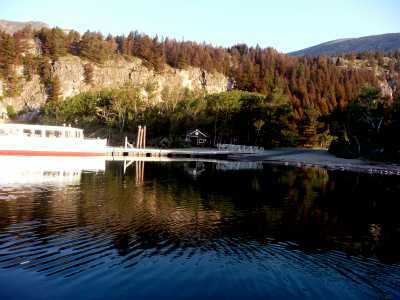 One can access both sides of the park with boat in tow by driving Route 2, a beautiful road over Marias Pass. 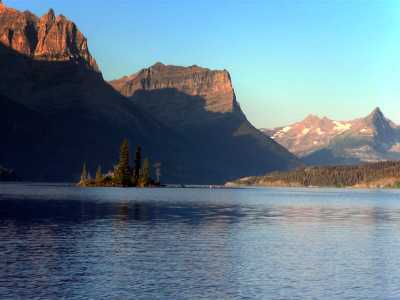 ------ There are many lakes in Glacier National Park and most are suitable for canoes or kayaks only. 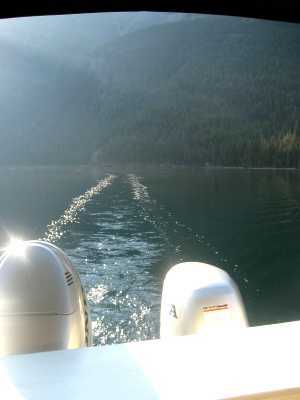 Several lakes allow motorized boats. 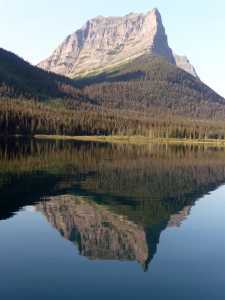 On an earlier visit to Glacier, with our small children, we launched our canoes unto Bowman Lake, in the northwestern part of the lake, and had a delightful paddle. 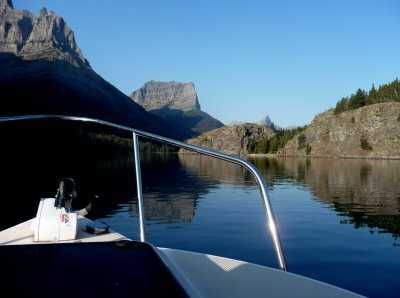 This trip, sans kids, we wanted to check out the possibility of cruising Halcyon on four of the largest and most interesting lakes in the Park: McDonald (on the west side), Saint Mary, Upper Waterton and Two Medicine. McDonald didn't work out. 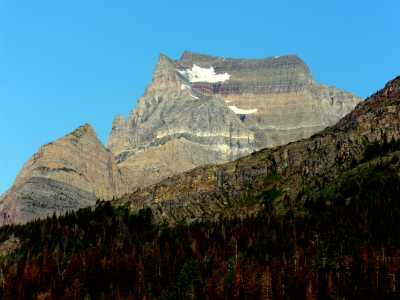 Now across Marias Pass, and on the east side of the park, we were checking out Saint Mary Lake. 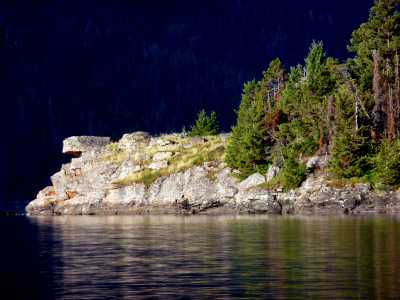 Same sad news - no overnight anchoring on the lake, even at campsites with a back country permit. 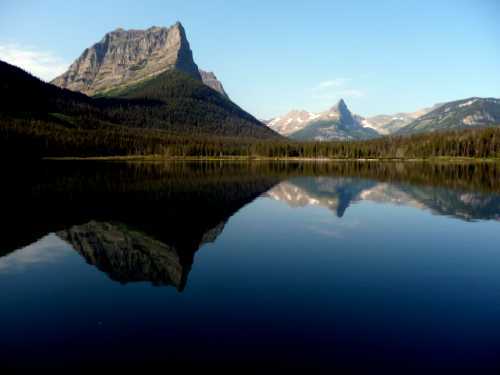 We tried to explain to the ranger that such a policy would allow the park service to inspect the safety of a boat on the lake, and would be a safety factor to help rescue canoeists in bad weather or capsizing. No avail. 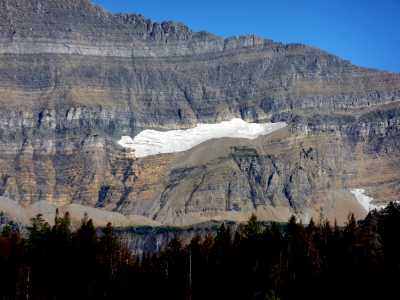 ------ The ramp was, however, in much better condition than the west side Apgar ramp. Only problems we could see was that the slope of the ramp was too low, and it might be hard to get the boat off the trailer and the commercial cruise boat was tied a little too close off the end of the shallow ramp. But we decided we'd give it a try the next day. ------ What a beautiful evening. 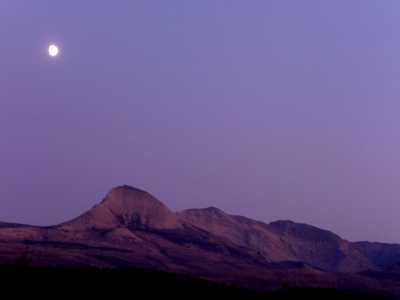 The sun slowly lit up the peaks to the south of the campground, and soon an almost full moon was glowing the hills in a soft light. ------ Early the next morning, we slipped out of the campground in our C-Dory "RV." A Black Bear was feeding in the berrry bushes beside the campground entrance road - "a good omen" we thought. We arrived at the ramp and were alone. 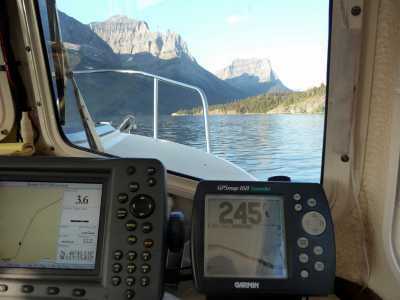 ------ I backed the trailer down as El held the docking lines. Farther, farther, a little jerk to free the boat - nothing! Farther, farther - the exhaust pipe was under and burbling - at last, with El pulling and another quick stop for the trailer and Halcyon slid reluctantly off the bunks. Hooray! El stopped her before hitting the tour boat, I zipped the truck and trailer back to the parking lot, and we were on our way. We felt like two kids with hands in the cookie jar - we had the treats and no one was there to stop us - and we didn't have to share except with each other. ------ The night before, when checking out the ramp, the wind was howling. Chatting with the campground host about the wind he said wryly "When doesn't the wind blow? Never! 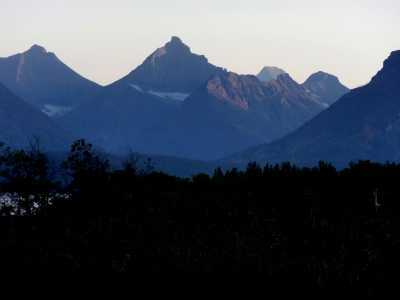 She's always blowing here in the mountain valley. 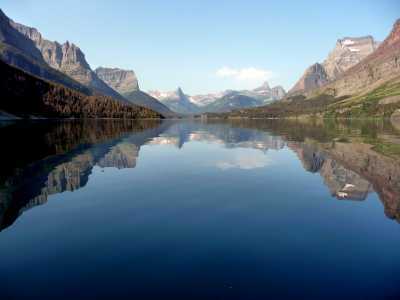 I've hosted here for years and have never seen a perfectly calm day." 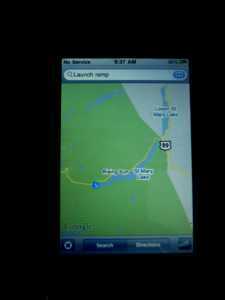 ------ But our launch morning held the bear omen - it was magic. Not a breath of air. 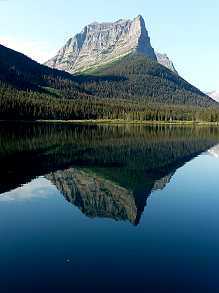 The reflections were mirror perfect. 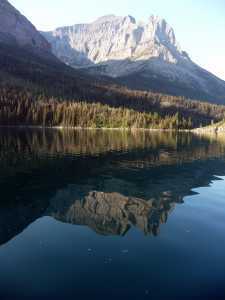 We were the only folks on the lake - even the gulls seemed impressed by the stillness, so they sat motionless on rocks and studied the upside down mountains in the lake. 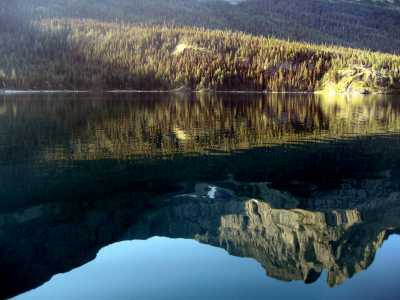 ------ A calm day, full of reflections, on the lakes in the Rockies is unusual. We had a delightful morning of drifting slowly (even cooked breakfast on the lake). We didn't interupt the gift of silence and beauty (we even talked with each other in whispers) and so don't want to interfere with your shared experience with us by written words. 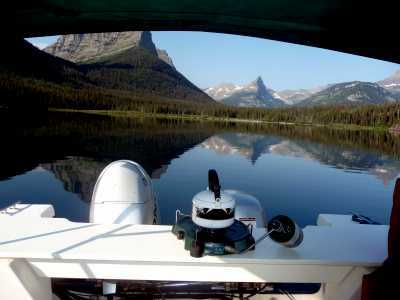 Enjoy a few moments of peaceful solitude, as you cruise Saint Mary Lake with us. 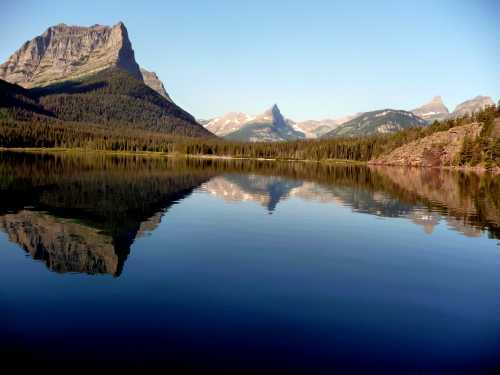 Adieu, Saint Mary Lake - Thanks!